Anne Lindberg creates subtle drawings and installations that blur the line between traditional media. Made from colored thread and graphite, her meditative works are studies in formal abstraction, complicating viewers’ perceptions of relationships to the objects themselves. Lindberg resides in Kansas City and holds a M.A. from Cranbrook Academy of Art and a BFA from Miami University. She was Visiting Artist-in-Residence/Head of Department at Cranbrook Academy of Art in 2005 and taught for nine years at the Kansas City Art Institute. Her work has been shown at the Kemper Museum of Contemporary Art, The Drawing Center in New York, the Daum Museum of Contemporary Art and the Sheldon Memorial Art Museum. 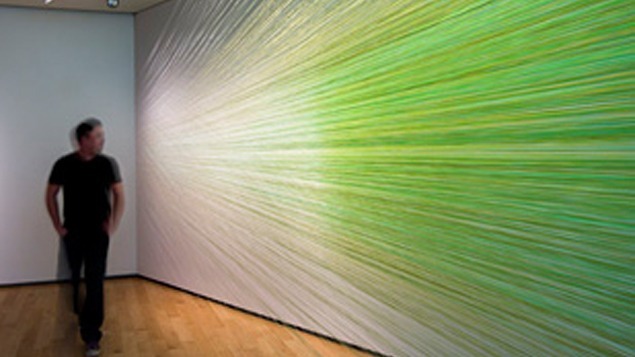 Lindberg was also recently awarded the 2011 Painters & Sculptors Joan Mitchell Foundation Award.